Since Sean Acosta founded P.T.R.C., Inc. (Property Tax Reduction Consultants) 27 years ago, he has handled more than 285,000 property assessment challenges and helped secure millions of dollars in tax savings for homeowners. A former New York City police officer, Acosta got into tax-grieving after a brief stint in residential real estate speculation. 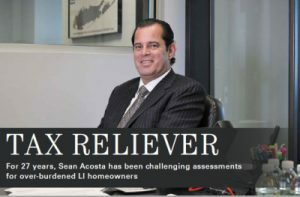 His Jericho-based firm works with homeowners and Long Island taxing authorities to try and whittle down unfair residential assessments through the often complicated tax grievance process.